Published By Patrick Malone & Associates, P.C. Let’s give thanks to all the doctors, nurses, and others who will devote time during the holidays to taking care of others—and let’s give at least a small cheer for some hospitals, yes, that occasionally fulfill a higher mission than pure profit making. Practically speaking, the Ascension hospitals’ bean counters calculated that it was unlikely that the system ever would collect that money owed, or it would cost more to do so than it was worth. But the system’s CEO also is quoted as saying that, as a Catholic institution, Ascension needed to recognize its moral obligation to help the sick and poor. I’ve written how great a bane high-deductible health insurance policies have become to many Americans, most especially those who get their coverage at work—and not through health insurance exchanges under the Affordable Care Act aka Obamacare. Americans have grown angrier and angrier with their health coverage, misdirecting their fury at Obamacare when it is their employers who have shifted costs on to workers by giving them incentives (lower monthly premiums) in exchange for taking high-deductible policies. Unfortunately, more Americans, living paycheck to paycheck, save too little so they can’t pay out of pocket costs. Instead, they scrimp and skip needed medical services. The challenge of paying medical debt no longer plagues just the inner city poor, it is afflicting increasing numbers of Americans, as has been reported by the Henry J. Kaiser Family Foundation and the New York Times (see figure above). If hospital systems like Ascension can help struggling patients by waiving deductibles and forgiving unpaid medical debt, more power to them. As Modern Healthcare points out, the hospitals can benefit, too: They often can get important tax exemptions as not-for-profit institutions. To do so, they must demonstrate, including through “community health needs assessment” for the Internal Revenue Service, that they have provided “community benefits.” These can include charitable care but not bad debt. The nonprofit Kaiser Health News Service, meantime, has reported on the Scrooge-like practices of some hospitals, which hit patients as soon and as often as allowed, to fork over payment for sums that may not be covered by health insurance. These are dubbed “point of service” collections and have staffers chasing patients for credit cards or other means to cover their deductibles immediately, some times even as they are admitted. At many doctors’ offices and hospitals, a routine part of doing business these days is estimating patients’ out-of-pocket payments and trying to collect it up front. … But there’s a big difference between handing over a credit card to cover a $20 co-payment versus suddenly being confronted with a $2,000 charge to cover a deductible, an amount that might take months to pay off or exceed a patient’s credit limit. Doctors may refuse to dispense needed care before the payment is made, even as patient health hangs in the balance. 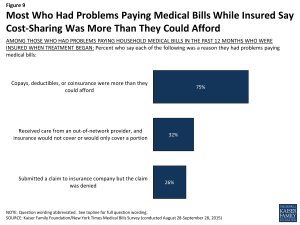 The story says that the advance credit card payment can make it harder for patient-consumers later to contest charges. Many patients may not have credit limits that allow them to cover their deductibles or they may arrive at the hospital without a card in hand. Federal and state laws may limit the vigor with which rapacious staffers can go after patients for point of service collections. But the health news service, in a report that’s certain to raise many readers’ ire, points out that the sick or injured are especially vulnerable when dunned, and regulators likely aren’t present for on the spot protection or appeal. This is an unacceptable practice to me, and hospitals, regulators, policy- and law-makers need to bring it to a halt. As I’ve written, all medical bills are negotiable, and patient-consumers need to be as aggressive as health care providers can be about figuring what exactly constitutes fair, timely payment for medical services. Meantime, I’ve written about another medical billing practice that infuriates many: the so-called surprise charges that crop up when patients receive treatments from caregivers who may not be part of their insurers’ medical provider networks. With as many as 1 in 5 patients whacked after an emergency room visit with such surprise billings, consumer advocates have called on members of Congress to step up to pass legislation to curb this costly, abusive practice. Bill Nelson, the Democratic U.S. senator from Florida, has taken what may be a valuable step in this direction, writing to the Federal Trade Commission to ask the agency to investigate. People interested in learning more about our firm's legal services, including medical malpractice in Washington, D.C., Maryland and Virginia, may ask questions or send us information about a particular case by phone or email. There is no charge for contacting us regarding your inquiry. A malpractice attorney will respond within 24 hours. All contents copyrighted 2015 Patrick Malone & Associates except where copyright held by others. Reproduction in any form prohibited except where expressly granted. Copyright © 2015 – 2019, Patrick Malone & Associates, P.C.